When you think of all the impressive ways people have harnessed the iPhone to create art and then realize the exponential increase in potential brought by the iPad, you can’t be blamed for your mind blowing. 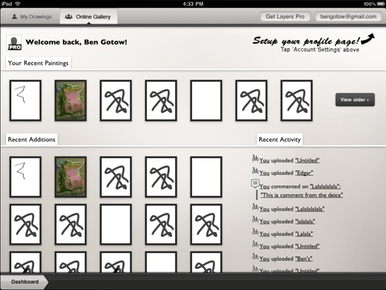 Take, for example, the forthcoming iPad version of Ben Gotow’s Layers. The original Layers for the iPhone is a painting app where you can create works of art just using your fingers. Even better, as the name suggests, the app lets you create multiple layers for your artwork, letting you unlock all sorts of neat possibilities. And the iPad version looks to take the possibility for great art yet a step further. 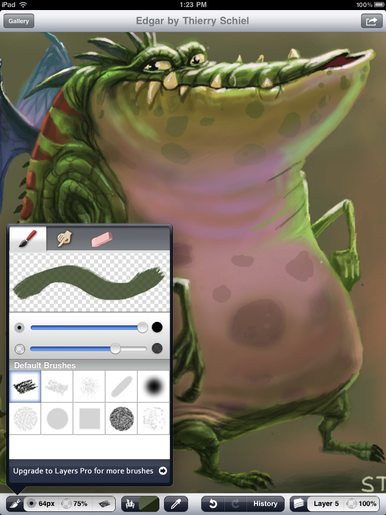 As with the iPhone version, the basic version of Layers for the iPad allows you to create paintings with multiple layers, variable brush sizes, and more. Gotow says the basic $7 version of Layers will sport two layers with three brushes—via in-app purchase, users can spend $3 to upgrade to Layers Pro, which adds three more layers and seven more brushes, as well as an “Export to Photoshop Feature.” The Pro version will get more features in future updates as well. In addition, both versions of Layers will have the option to upload your work to an online gallery, where you can also browse others’ work and leave comments right fom inside the app. Gotow says in the future the gallery will also be used to feature great artists, run painting contests, and more. Layers for the iPad is available in the App Store now though you’ll probably want to wait to have an iPad in hand before buying it.